All people dream about having true love. We all want to meet someone special, fall in love with them live happily ever after. Unfortunately, very often our dreams are completely different from the reality which happens to us. There are cases when everything seems to be perfect, but people still feel that something goes wrong. If you are one of them, you should think if your love is true and your partner is really that particular person you can’t live without. Today we have some important information for you. 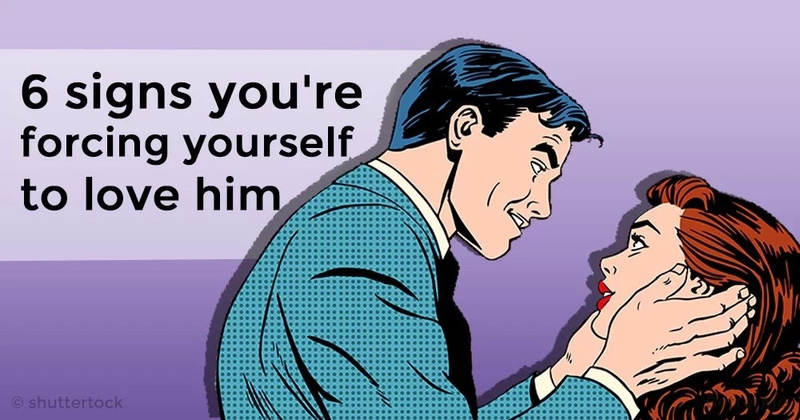 Here are 6 signs that you are forcing yourself to love your partner. It may sound ridiculous, but it happens. If you think that some of them probably describe you, it’s better to think about your relationship more deeply. There are many great guys, but that doesn’t mean that you should be in relationship with all of them, right? The same is here. If you feel that something is wrong you should think about the reason why you are in this relationship. If it’s because he is a great guy, you shouldn’t continue this relationship. There is no place for “but” between people who really love each other. People who are completely happy in their relationship have no such thoughts. They know for sure that happy relationship exist and they are those lucky ones who have such relations. If you have doubts that happy couples exist, then there might be some problems between you and your partner. If you suffer from frequent mood swings since you started dating with your partner, it can mean that you should do something with your relationship. If you are forcing yourself to love someone, your mental health can’t be in order. It’s very hard to hurt someone, when you know that they love you. Some people feel guilty and can’t say these words to those who are ready to do everything for them. However, you should know that delaying the problem you can’t solve it. There are cases when people break up several times, and one of the partners comes back all the time begging to start everything again. Then the other one can’t resist and agrees to try again. This is the biggest mistake. If you are just tired of rejecting, you won’t be able to build happy and strong relationship. Very rarely desperation leads to something good. You should know that until you are able to stay happy being single, you won’t manage to find happiness being in relationship. You should never start any relationship just because you are tired to be alone. Besides, it will be unfair to another person, who might love you. They also deserve true love. You should start romantic relationship only when you meet your real soulmate and feel that this person is yours.